As part of Chiropractic Awareness Week (10 – 16 April) the team from Headingley Chiropractic Clinic is urging people to take a break from their tech. New consumer research from the British Chiropractic Association (BCA) has revealed that computers are the top tech back pain trigger for people in Yorkshire, with 21% of those surveyed having experienced back or neck pain after using their laptop, and 28% after using a desktop computer. Despite these figures, just 12% of people in Yorkshire have either limited or stopped using their laptop due to concerns for their back and neck health or posture and that figure is 11% for desktop computer users. Your workplace can be an unhealthy environment. The physical act of sitting for long periods – especially with poor posture – can be detrimental to your health. 1. Set your phone or watch to remind you every hour to get up and walk for at least five minutes. This will also help your concentration. Learning how to touch type (not having to look at the keyboard to type) is an essential skill to obtain correct posture. 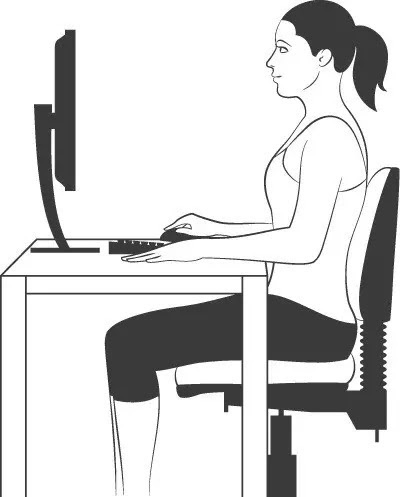 Bring the chair in close to the desk so that with your elbows by your side and at right angles you can reach the keyboard. You may need to get armrests that are half length or take them off completely. The mouse should be right by the keyboard (use a short keyboard unless you do a lot of numerical input). The top of the monitor shoulder be at eye-level- assuming you are looking straight ahead. It should also be an arm’s length away. 3. To correct a stooped posture – try to sit upright – imagining that someone is pushing down on your head. This is opposed to pulling your shoulder blades together and pushing your chest out. As always, if you have any questions regarding the above information, just call one of our chiropractors on 0113 228 9888. We would also be happy (with the permission of your employers) to come and have a look at your workplace.